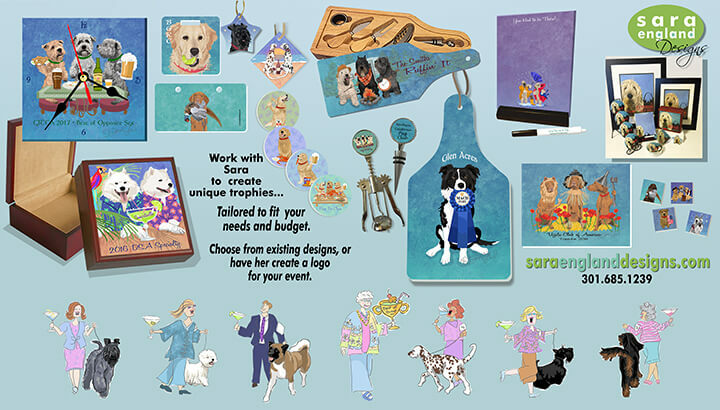 Sara has an array of unique products tailored to fit your dog event needs and budget, and to create a one-of-a-kind trophy/award memory. Work with Sara to develop a customized, unique-to-your-event product grouping. Please see below some of Sara's original trophy package creations. Give us a call 301-685-1239 or email michael@saraenglanddesigns.com today to begin creating your dog event trophy/prize package. Please peruse our Trophy Catalog and email us a completed Trophy Request.